I am back from my extended leave at modeling. I had started building Dragon Initial Tiger a while back and it got put to the side. I have decided to try and finish it before starting anything else. I don’t have a lot of references that show this Tiger. I have Tigers in Combat I, Tiger I on the Eastern Front and Frontline Illustration’s Tanks in Detail 02 Initial Production Tiger I (Russian) at least that is what I am told the title said. I am looking for any rear shots I hope exists that anyone might have or and insight into the items circled in red on the drawings as I am not sure if they are correct. I do know the lights are wrong and have been omited. But the jack block and crank handle I am not sure of. Also the number looks to be black? Thanks for any help. 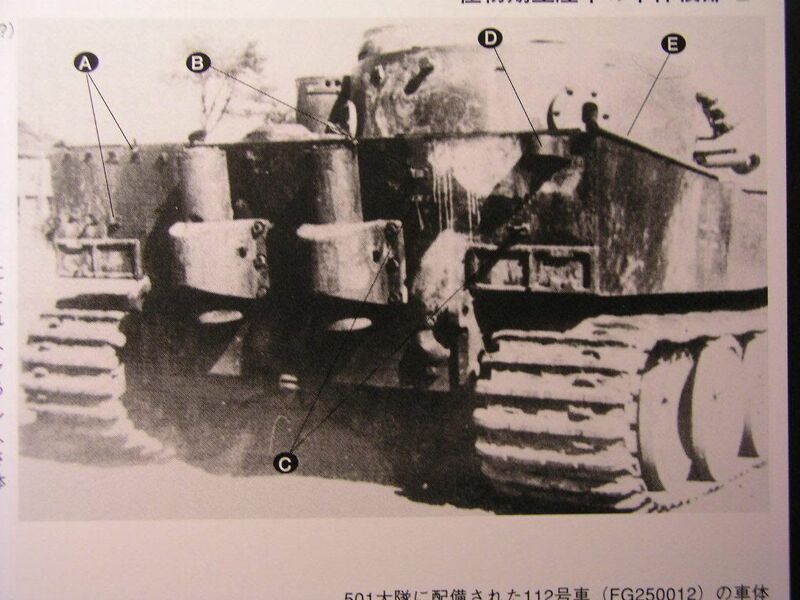 if you refer back to TIC 1 [hardback] you should find that this vehicle is an upgraded 111 that has been re-numbered to 2 when 502 re-numbered in early 43.The numbers were solid black according to schnieder. The photo looks to be in the spring, a couple of months after winter as it has also picked up a production style turret bin. There is also the metal plate on the front glacis which is also found on 111 in late 42. There is a rear shot in the hard back of 111 [see my vbench on 111]. Ian thanks a lot. I only have the softcover TIC 1. I new they had been renumber and though I had read somewere the numbers were black but had been a year ago so thanks for confermation on that. Well check out your thread for the picture. I have seen and even think it is in one of my books. Some how I missed of or forgot it was the one I was looking for. Oh by the way Nice build. I see one thin on yours I missed. Again thanks. Last edited by mnickolson; 05-30-2007 at 06:38 AM. Good to see you back. This should be a nice build. Nice to be modelling agian . I am like 80% finished with it but still have to fix a few things now that I have a better clue of what and I will post some shots later today. Hate to say it, but that does not look like a standard turret bin to me. It seems too wide - it overlaps the pistol port. And I think a standard bin would be issued with the normal supports to hold it above and below. This one has some jerry-rigged strips on the side. Front- No tools or jack block. Lights were detachable so you can place them at will. The pics I've seen show it without the lights. Turret- use part C6 only for a tank on the move. I dont think this cap was used in combat. The crew would choke after a few shots. The loaders pistol port should be mounted identical to the commanders port and not be mirrored. The dragon instructions for this are only correct for Tiger #100. The hull of 111 carried different turrets (its believed 502 swaped turrets on there Tigers to keep tanks in action) and numbers (111-2-5-?). Turrets 2 and 5 had escape hatches. For a period "high" exhaust were fitted. Well this is my interpretation of the different info that is flooting around in books and on the net. Here is a pic of #111 here you can see the ax and holder.